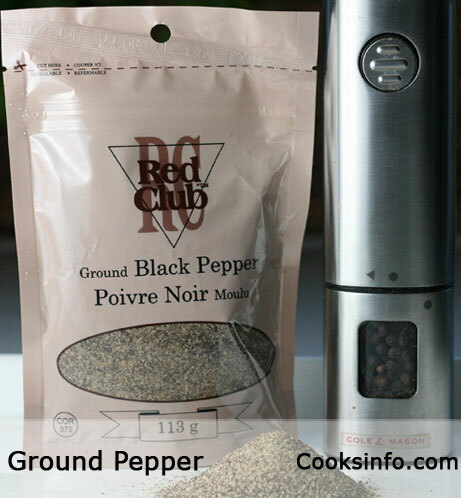 Ground Pepper is a spice made from peppercorns that have been ground. Generally, it comes already ground for you in packages or bottles, in black or white versions. It is useful in recipes where a quantity is wanted that would take some time to grind yourself on the spot. It needs to be kept in a tightly-sealed container out of the light, and checked yearly to ensure freshness and flavour. If maintained, it will still retain a strong enough flavour that grinding your own on the spot for pepper to go into dishes won’t be necessary. The Roman writer Apicius frequently called for Ground Pepper (“piper tritum”) in his recipes. The use of pepper is one of the many signs that his recipes were for the very rich, because only the very rich could afford pepper — tritum or otherwise.